\r\n\r\nThe embryo acquires a double rows of cilia, a well-developed pair of lateral tentacles, and a large, apical sense-organ. The entodermal part of the gastro-vascular system consists of 6 lateral diverticula from a central chamber; 2 of these lateral branches lead into the bases of the tentacles and the other 4 lead outward toward the 4 double rows of cilia. The ectodermal buccal pouch or stomodeum has become a long, laterally compressed tube, with its broad axis 90* from the tentacular axis of the animal. Until this time the animal swims about quite freely within the egg-envelope at this stage its cilia may be observed beating in a normal manner and its tentacles to elongate or contract in response to stimuli. Soon after this the larva breaks through the egg-envelope and escapes into the water. Here it passes the development stages which are very similar to those of the young Pleurobrachia. \r\n\r\nThe tentacles acquire numerous lateral filaments and elongate greatly, as in Pleurobrachia. When the animal is 5mm long, the oral lobes begin to develop as two simple outgrowths on both sides of the mouth in the sagittal plane of the animal. At the time when the oral lobes begin to develop, the meridional ventral canals and the paragastric tubes begin to elongate downward. The former give rise to the characteristic loops in the oral lobes. Four meridional vessels extend downward and fuse with the circum-oral vessel. The primary tentacle-bulbs migrate downward to lie close by the sides of the mouth. The auricles appear last of all, after the lobes have developed to some extent. When attaining 10mm long the animal becomes ellipsoidal in outline. The appearance of its lobes and auricles resembles to that in the adult of Bolinopsis. Afterward the deep, lateral furrows extend upward to the level of the apical sense-organ and the animal acquires the characteristic of Mnemiopsis ( Mayer, 1912 ). The embrional development takes about 20-24 hours in the Black Sea upper water layer by 23 degrees C. The size of hutched larvae is 0.3-0.4mm. In the early 1980s, Mnemiopsis leidyi was accidentally introduced via the ballast water of ships to the Black Sea where it had a catastrophic effect on the entire ecosystem. It was also introduced into the Caspian Sea via the ballast water of oil tankers. Compiler: Dr. John Costello, Biology Dept., Providence College, Providence, RI, USA. Review: Dr. Tamara Shiganova. P.P.Shirshov Institute of Oceanology, Russian Academy of Sciences, Russia. Recommended citation: Global Invasive Species Database (2019) Species profile: Mnemiopsis leidyi. Downloaded from http://www.iucngisd.org/gisd/species.php?sc=95 on 19-04-2019. \r\nOne of the factors that provoked high level of population development of M. leidyi in the Black Sea but was not observed within its natural range-estuarial waters of North America was the absence of a predator feeding on M. leidyi and controlling its population size (Purcell et al., 2001). 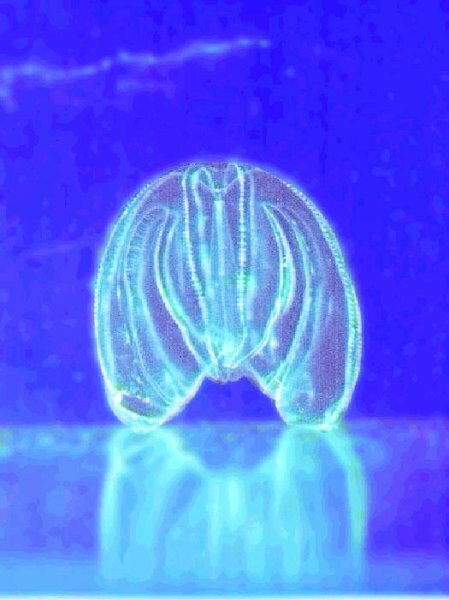 In 1997, another invader, the ctenophore Beroe ovata Mayer 1912, was found in the northeastern Black Sea. It is a predator feeding on planktivorous comb jellies - especially M. leidyi (Konsulov and Kamburskaya, 1998). As with its predecessor, B. ovata arrived with ballast waters from the same coastal waters of North America (Seravin et al., 2002). Development of B. ovata considerably decreased the population of M. leidyi that had deformed the Black Sea ecosystem for over a decade. The reduction of the M. leidyi population limited its influence on the ecosystem and consequently we observed a recovery of the main components of the Black Sea pelagic ecosystem – zooplankton (including meroplankton), phytoplankton, dolphins and fish as well as their eggs and larvae (Shiganova et al.,2000a,b; 2001 c). \r\nConscious of this, and bearing in mind the devastating impact of M. leidyi on the fisheries in the Black and Azov Seas in the 1990s, we began a number of initiatives in 2001 with a view to take stock of the situation, review and assess remedial measures and take concrete actions. After deliberation, we proposed the introduction of a potential predator of M. leidyi as the only truly viable option. 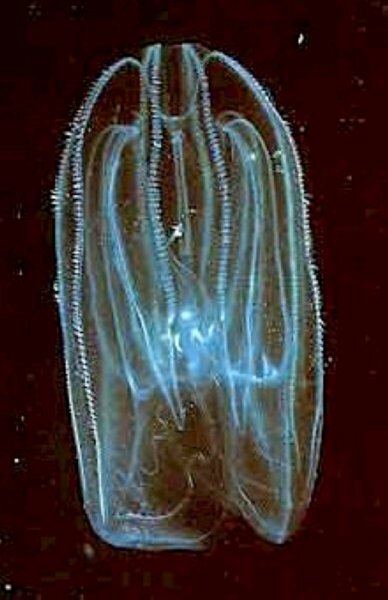 As shown by the example of the Black Sea, the best – and so far only - candidate for this is another ctenophore species, Beroe ovata. After the accidental introduction of Beroe ovata to the Black Sea, the abundance of M. leidyi here immediately dropped to levels so low that no further damage was inflicted. In fact, the ecosystem almost immediately began to recover. It is anticipated that the results of a Beroe ovata introduction in the Caspian will be similar. Summer 2003 is now the target date for the implementation of this plan (Dumont and Shiganova, unpublished). Informations on Mnemiopsis leidyi has been recorded for the following locations. Click on the name for additional informations. Summary: Details about an April 2001 workshop convened to combat the threat of a comb jellyfish invasion of the Caspian Sea. Dumont, H., Shiganova, T. (unpublished). 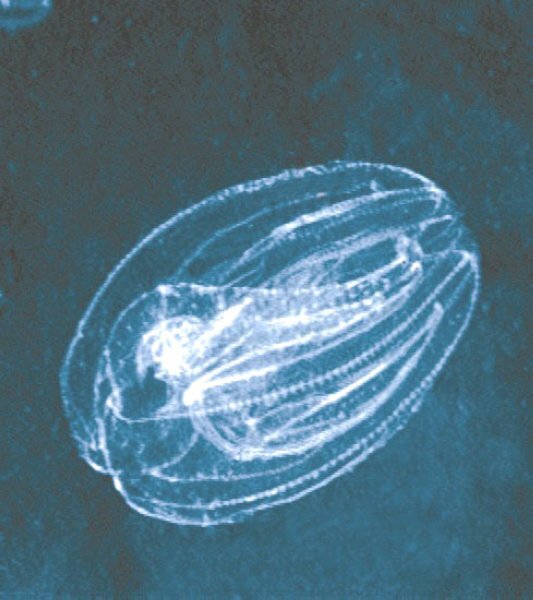 The Invasion of the Black, Mediterranean and Caspian Seas by the American Ctenophore, Mnemiopsis leidyi Agassiz: a Multidisciplinary Perspective . A NATO ARW Workshop. Summary: Proceedings of the Advanced Research Workshop (ARW) held on June 24-26, in Baku, Azerbaijan. The final conclusion of the workshop may be summarised as follows: all available wisdom strongly suggests to introduce Beroe to the Caspian as soon as possible, preferably in September 2002, and immediately thereafter initiate studies on Peprilus or fish with a similar feeding regime, as a medium-term possible final remedy. Knowler, D. Reassessing the costs of biological invasion: Mnemiopsis leidyi in the Black Sea. Ecological Economics 52(2): 187-199, 2005. Dumont, H. J. 2000. Endemism in the Ponto-Caspian fauna, with special emphasis on the Onychopoda (Ccrustacea).. Advances in Ecological Research 31. GESAMP, 1997. Joint Group of Experts on the Scientific Aspects of Marine Environmental Protection. Opportunistic settlers and the problem of the ctenophore Mnemiopsis leidyi invasion in the Black Sea. Rep.Stud.GESAMP. (58):84 p.
Ivanov V.P., Kamakin A.M., Ushivtzev V.B., Shiganova T. A., Zhukova O., Aladin N., Wilson S.I, Harbison R and Dumont H.J. 2000 Invasion of the Caspian Sea by the Comb Jellyfish Mnemiopsis leidyi (Ctenophora). Biological Invasions 2: 255-258. Kremer, P. 1979. Predation by the ctenophore Mnemiopsis leidyi in Narragansett Bat, Rhode Island. Estuaries 2. Summary: A Report on methodology for monitoring Mnemiopsis and other gelatinous macroplankton in the Caspian Sea prepared for the Caspian Environment Program, Baku, Azebaijan in December-2001. National Introduced Marine Pest Information System (NIMPIS), 2002. Mnemiopsis leidyi species summary. National Introduced Marine Pest Information System (Eds: Hewitt C.L., Martin R.B., Sliwa C., McEnnulty, F.R., Murphy, N.E., Jones T. & Cooper, S.). Available at http://crimp.marine.csiro.au/nimpis [accessed 20/08/2003]. Purcell J. E., Shiganova T.A., Decker M. B., Houde E.D. 2001. The ctenophore Mnemiopsis leidyi in native and exotic habitats: U. S. estuaries versus the Black Sea basin // Hydrobiologia. 451. 2001. Eds. J.E.Purcel, W.M.Graham & H.J.Dumont:, Kluwer Acad. Pub., P.145-176 . Shiganova T.A. 1993. Ctenophore Mnemiopsis leidyi and ichthyoplankton in the Sea of Marmara in October of 1992. Oceanology 33: 900-903. Shiganova T.A. 1997. Mnemiopsis leidyi abundance in the Black Sea and its impact on the pelagic community. In Sensivity of the North, Baltic Sea and Black Sea to antropogenic and climatic changes Sp.Volume. ?d. E. Ozsoy and A.Mikaelyan. Kluwer Acad. Pub.p.117-130. Summary: Information about Mnemiopsis leidyi prepared for the Group on Aquatic Alien Species (GAAS). This group is supported by the Russian government s Biodiversity Program, as part of the Project Development of scientific and methodological basis for organization of biodiversity monitoring and recommendations for prevention and control of alien species introductions in water systems: Lake Ladoga - Neva River-Neva Bay - eastern Gulf of Finland and lower Volga River - north Caspian Sea . Includes: Systematic position, Images, Invasion history, Worldwide distribution, Donor areas, Recipient areas, Biology, Environmental impacts and References. Shiganova T. A., Mirzoyan Z. A., Studenikina E. A., Volovik S. P., Siokou-Frangou I., Zervoudaki S., Christou E. D., Skirta A. Y., and Dumont H. Population development of the invader ctenophore Mnemiopsis leidyi in the Black Sea and other seas of the Mediterranean basin.// Marine Biol.. 2001?. 139 P.431-445. Shiganova, T., Bulgakova, Y., Volovik, S., Mirzoyan Z,. and Dudkin, S., 1998. The new invader Beroe ovata Mayer 1912 and its effect on the ecosystem in the northeastern Black Sea. Hydrobiologia 451: 187�197, 2001. Summary: The abundance, biomass and distribution of the ctenophore, Beroe ovata Mayer 1912 were assessed along with several parameters associated with composition, respiration and feeding. Digestion time of B. ovata feeding on other ctenophores ranged from 4�5.5 h for Mnemiopsis leidyi A. Agassiz to 7�8 h for Pleurobrachia pileus (O. F. M�ller). Daily ration was estimated as 20�80% of wet weight based on field observations of feeding frequency coupled with digestion time. Calculations indicate that the measured population of B. ovata ingested up to 10% of the M. leidyi population daily. A marked decrease in M. leidyi density was recorded. The abundance of zooplank-ton increased about 5-fold and ichthyoplankton about 20-fold compared with the same season in previous years following the M. leidyi invasion. Sorokin, Y. 2001. The Black Sea. Backhuys Publishers. Studenikina, E. I., S. P. Volovik, I. A. Miryozan & G. I. Luts, 1991. The ctenophore Mnemiopsis leidyi in the Sea of Azov. Oceanology 3: 722-725. Vinogradov, M. E., E. A. Shushkina, E. I. Musaeva & P. Y. Sorokin, 1989. Ctenophore Mnemiopsis leidyi (A.Agassiz) (Ctenophora: Lobata) - new settlers in the Black Sea. Oceanology 29: 293-298. P.P.Shirshov Institute of Oceanology RAS, 117997 Moscow, Russia, Nakhimovsky prospect, 36.